Radio/optical composite of the Orion Molecular Cloud Complex showing the OMC-2/3 star-forming filament. GBT data is shown in orange. Uncommonly large dust grains there may kick-start planet formation. Credit: S. Schnee, et al. ; B. Saxton, B. Kent (NRAO/AUI/NSF); We acknowledge the use of NASA’s SkyView Facility located at NASA Goddard Space Flight Center. A team of astronomers has discovered that filaments of star-forming gas near the Orion Nebula may be brimming with pebble-size particles. If confirmed, these particles may represent a new class of interstellar particles that could help jump-start planet formation. Astronomers using the National Science Foundation’s (NSF) Green Bank Telescope (GBT) have discovered that filaments of star-forming gas near the Orion Nebula may be brimming with pebble-size particles — planetary building blocks 100 to 1,000 times larger than the dust grains typically found around protostars. If confirmed, these dense ribbons of rocky material may well represent a new, mid-size class of interstellar particles that could help jump-start planet formation. 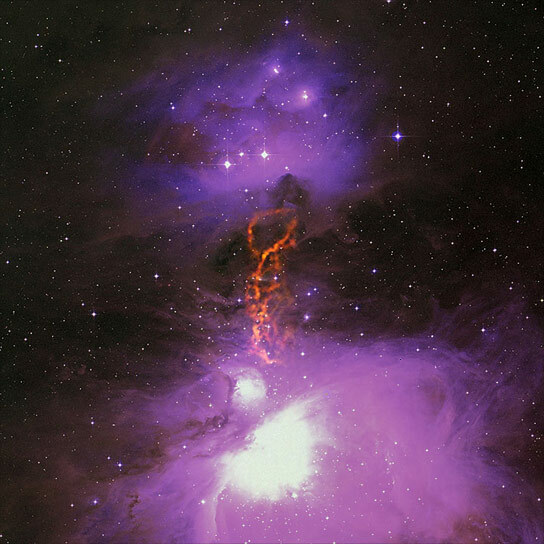 The new GBT observations extend across the northern portion of the Orion Molecular Cloud Complex, a star-forming region that includes the famed Orion Nebula. The star-forming material in the section studied by the GBT, called OMC-2/3, has condensed into long, dust-rich filaments. The filaments are dotted with many dense knots known as cores. Some of the cores are just starting to coalesce while others have begun to form protostars — the first early concentrations of dust and gas along the path to star formation. Astronomers speculate that in the next 100,000 to 1 million years, this area will likely evolve into a new star cluster. The OMC-2/3 region is located approximately 1,500 light-years from Earth and is roughly 10 light-years long. Based on earlier maps of this region made with the IRAM 30 meter radio telescope in Spain, the astronomers expected to find a certain brightness to the dust emission when they observed the filaments at slightly longer wavelengths with the GBT. Instead, the GBT discovered that the area was shining much brighter than expected in millimeter-wavelength light. Though incredibly small compared to even the most modest of asteroids, dust grains on the order of a few millimeters to a centimeter are incredibly large for such young star-forming regions. Due to the unique environment in the Orion Molecular Cloud Complex, the researchers propose two intriguing theories for their origin. The first is that the filaments themselves helped the dust grains grow to such unusual proportions. These regions, compared to molecular clouds in general, have lower temperatures, higher densities, and lower velocities — all of which would encourage grain growth. The second scenario is that the rocky particles originally grew inside a previous generation of cores or perhaps even protoplanetary disks. The material could then have escaped back into the surrounding molecular cloud rather than becoming part of the original newly forming star system. The most recent data were taken with the Green Bank Telescope’s high frequency imaging camera, MUSTANG. These data were compared with earlier studies as well as temperature estimates obtain from observations of ammonia molecules in the clouds. A paper detailing these results is accepted for publication in the Monthly Notices of the Royal Astronomical Society. The GBT is the world’s largest fully steerable radio telescope. Its location in the National Radio Quiet Zone and the West Virginia Radio Astronomy Zone protects the incredibly sensitive telescope from unwanted radio interference. Later this year, the GBT will receive two new, more advanced high frequency cameras: MUSTANG-1.5, the even-more-sensitive successor to MUSTANG, and ARGUS, a camera designed for mapping the distribution of organic molecules in space. 2 Comments on "Pebble-Size Particles May Represent a New Class of Interstellar Particles"
Consider the consequences for a starship traveling at .1 c. that hit one of these pebbles. Instant destruction. It seems to me that the pebble sized interstellar matter may have created innumerous small comets which is found universally in the cometary cloud found around ANY star for that matter. Our comets are small sized only about 1 kilometer to 10 kilometer in length which should be the primordial interstellar matter formed. Those which were successful became many planets and plenetoids and even asteroids. But comets are infinitely large when compared for that matter in interstellar space. Thank You.